Kilauea at night: a massive magma chamber has been detected beneath the volcano's East Rift Zone.Courtesy Mark RyanResearchers from the University of Miami Rosentiel School of Marine and Atmospheric Science have detected a new, massive magma chamber beneath Kilauea, the most active volcano in the world. By analyzing seismic waves that traveled through the volcano, scientists from the school's geology and geophysics departments have been able to piece together a 3-dimensional velocity model of what's taking place deep below the volcano's caldera. "It was known before that Kilauea had small, shallow magma chambers," said Guoqing Lin, lead author of the study. "This study is the first geophysical observation that large magma chambers exist in the deep oceanic crust below." Located in oceanic crust between 5 and 6.8 miles beneath the volcano's East Rift Zone, the new chamber has been determined to be several kilometers in diameter. The seismic data also revealed that it's lava is composed of a slushy mixture of about 10 percent magma and 90 percent crystal. According to co-author and professor of geology and geophysics, Falk Amelung, the information is useful in understanding magma bodies and a high priority for the researchers because of the possible hazards created by the volcano. "Kilauea volcano produces many small earthquakes and paying particular attention to new seismic activity near this body will help us to better understand where future lava eruptions will come from," he said. Kilauea has been active for more than 30 years and is located in Hawaii Volcanoes National Park on the Big Island of Hawaii. The paper appeared in a recent edition of the journal Geology. Obsidian is made of felsic volcanic lava that cools quickly on the earth's surface or in water. The rapid cooling inhibits crystal growth, and along with obsidian's chemical composition (high in silica) contributes to the rock's hardness, brittleness, and glassy appearance. They are made when lava cools quickly on the surface causing obsidian to have its glassy surface. Obsidian is made when lava and water are mixed together and cooled down. This makes this mixture harden and turn into the thick, black rock that you see. obsidian is made when lava touches the water! How does the magna form into the volcano? NO RANDOM SILLY ANSWERS PLEASE!!!!!!! This explains it pretty well. 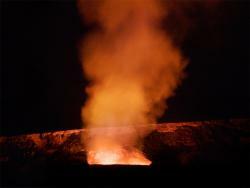 Plus you can search the site for more information about volcanoes. I think it isn't possible to live in a volcano, you will die. No it is not possible to live in a volcano. The magma and high tempatures would make that impossible. Please review your science textbooks Jaden for more information. I enjoyed learning about magma and the volcanoes that dont explode, only seep out goo! how are lava coblles foremed [only people from portland,or, know.